Book v. Voma Tire Corp., a case from the Supreme Court of Iowa, involved a lawsuit brought by the mother of a teen employee of an automotivbe shop. The shop, owned by teen’s father, purchased four tires from an Iowa retailer, and the tires were manufactured in China. In 2009, plaintiff’s son was working part time at the service shop through an apprenticeship program administered by his high school. The shop agreed to install four new tires on a customer’s horse trailer. The shop purchased the new tires from the Iowa retailer and began installing them on customer’s horse trailer. 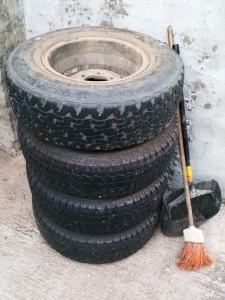 The teens’ father/shop owner attempted to set a 16.5″ inch tire on an older model 16″ rim. According to court records, this was a common mistake in the auto service industry. The father was distracted when the telephone rang and left the tire mounted on the wheel, but it was not yet fully inflated. When plaintiff’s son and fellow employee walked into the shop, they began to air up the tire without checking with the father. The tire exploded and severely injured plaintiff’s son. He was blinded in one eye, and lost part of his jaw. He also lost most of his sense of taste and smell as result of the tire explosion. He has undergone extensive rehabilitation and seen dozens of specialists to treat his injuries. Victim’s mother filed a products liability civil cause in the court sitting in the county in which they lived. She demanded money damages to compensate victim for his medical expenses, personal injury, and her loss of consortium. As our Boston products liability attorneys can explain, loss of consortium claims involve a loss in quality of relationship people can have as result of a personal injury. While in this case it was a mother claiming loss of consortium for an injury to her son, in the Commonwealth of Massachusetts, these claims are generally brought by a non-injured spouse. Her complaint initially named as defendants the company who manufactured the tire mounting press, the tire retailer, and the tire’s United States distributor. The company who manufactured the tire mounting machine was based in Italy. This company filed a motion to dismiss for lack of personal jurisdiction. Trial court granted defendant’s motion to dismiss and this defendant was dismissed from the lawsuit. The tire manufacturer also filed a motion to dismiss, but the judge held this motion in abeyance, so more information on how the tire got to Iowa could be propounded. This company is based in China. Trial judge eventually granted tire manufacturer’s motion to dismiss, and plaintiff appealed this to a state appellate court. On appeal, the court addressed the issue of personal jurisdiction. Their standard of review was one of correction for errors at law. On appeal, the court used the stream of commerce doctrine, which looks out how goods are transported across international and state lines in the ordinary stream of commerce. This is based upon numerous cases from the United States Supreme Court. Ultimately, the court found proper jurisdiction in the Iowa civil court and reversed and remanded the case for further proceedings consistent with its opinion.